Complementary therapies are systems of healthcare that treat the whole person, not just the symptoms of their disease. For millennia crystals have been instrumental in rituals of healing, and used to enhance physical, emotional and spiritual balance. As crystals work with energy and vibration, it’s little wonder that shamans, medicine men and healers from across time have been using their power for healing, divination, wisdom and communication. And while there remains no conclusive scientific research behind the mechanism of crystal healing, therapists, scientists, and researchers within the energy medicine community, have identified and demonstrated several theories. How does crystal healing help? May offer relief from aches, pains, aid detoxification, bring greater energy and help with more restful sleep. It may trigger your body’s own self-healing mechanisms. Older emotions and anxieties may be released and replaced by a renewed feeling of well-being and balance. You may be liberated from self-judgement and gain a renewed sense of security. The ability to let go of old, limiting beliefs during a Crystal Healing, allows for the building of greater self-trust, hence strengthening your ability to create more fulfilling relationships. You may experience a greater sense of calm and peace, more clarity and focus and relief from stress during and following a Crystal Healing. May facilitate a deeper connection to purpose and a sense of lightness may be experienced, as energetic balance is raised and restored. *Please note this is a complementary therapy. No diagnoses are offered. How does crystal healing work on the body? Our energy fields, chakras, meridians and vital organs each vibrate to their own frequency and during periods of ill health, this frequency changes. By introducing the appropriate crystal to our energy field, the imbalanced frequency can be raised or restored. This effect is known as Resonance. 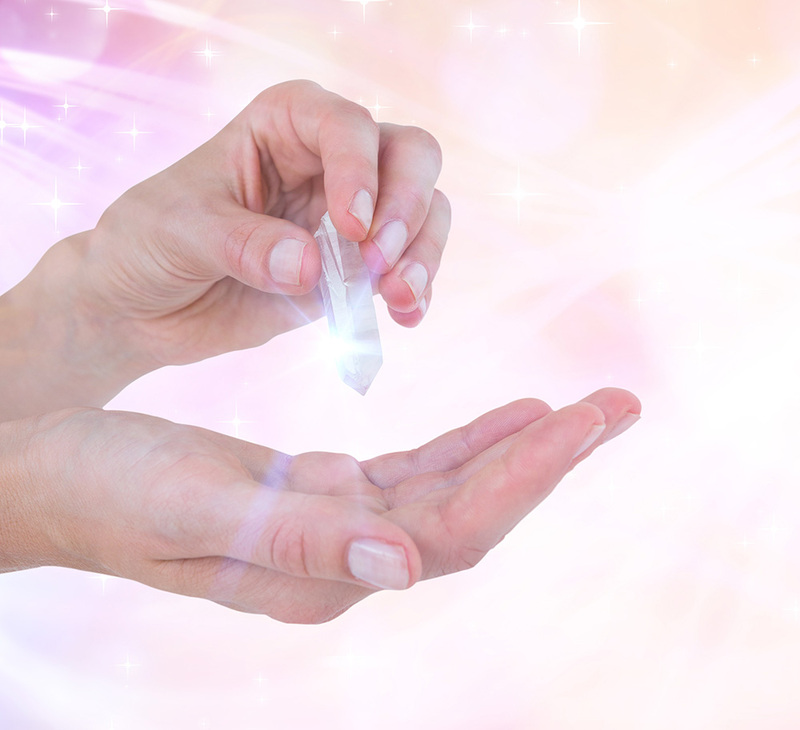 What occurs during Crystal Healing? During Crystal Healing you remain fully clothed, in a reclining position. A brief health history is taken and an assessment is made of your energy field. Crystals are then chosen intuitively and placed on or around the body whilst the client relaxes into a meditative state. A blend of our universal energy (combining Mesmerism, Javanese Magnetism and Pranic Healing) is then projected through the chosen crystals to enhance the healing vibration. How does Crystal Healing feel? Crystal healings are deeply personal and experienced differently by everyone. Some clients report feeling heat, cold, a breeze or tingling sensation on or around their body. Most report feeling calm and relaxed, while others notice the subtle energies as the body adjusts. For up to 48 hours after your crystal healing, you may continue to experience a clearing out of blockages, after which you will feel more energised and settled. If you are new to crystal healing, try one session to see if it resonates with you. Otherwise you may enjoy a short course of treatments, typically four, to more completely re-energise and re-balance, and then visit for an energy top up when necessary. Crystal healing is suitable for adults, teens and children. Plants, animals and spaces can also benefit from crystal energy. While Mesmerism leads the client into trance, Mesmerism is not hypnosis. A Mesmeric trance is induced by the therapist conducting passes through the client’s energy field and then engaging in an energy transference. Healing release is then able to occur as the body re-balances. Dr Franz Anton Mesmer is the accepted discoverer of Mesmerism, also known as animal magnetism; however these techniques and methods were known, and practiced, in ancient civilisations. Nevertheless it was through Mesmer’s research and testing that he was the first person to effectively demonstrate the existence of magnetic transference, without the use of magnets, and to structure it into a healing modality. During a Mesmeric treatment, no words are spoken, however some respectful touch may be necessary. This requirement will be explained prior to a session. Like Mesmerism, Javanese Magnetism™ is an energy technique used to access, attract, program and use all kinds of universal energy for healing purposes. It is based on one of the most powerful esoteric traditions of the Mataram Kingdom. Javanese Magnetism™ also involves the therapist conducting passes through the client’s energy field, an energy transference and the re-balancing of the chakras. Healing release is then able to occur as the body re-balances. Pranic Healing is the use of universal energy, also known as prana, to create health and well-being. This modern practice of Pranic Healing was established by Master Choa Kok Sui, a scientist, chemical engineer and enlightened teacher. Following 20 years of research and experimentation he developed a form of healing that effectively treats the client’s aura. During a treatment, clients are fully clothed and may comfortably sit or lie, while the therapist corrects energy imbalances and blockages, and removes depleted energy, replacing it with fresh prana.